Head Coach Tony Bennett has Virginia in the Final Four behind the clear concepts that power the Cavaliers offense and defense. 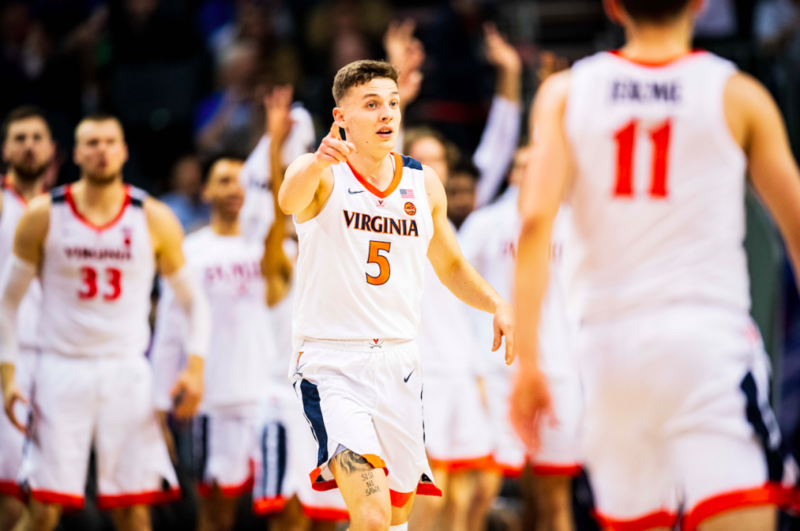 Even though the Virginia Cavaliers spent the entire season near the top of the polls, they were probably the #1 seed that was least expected to make it to the Final Four. Part of that could be due to UVA’s first round upset last season, and doubts that its style of play could take it all the way to the championship. The Cavaliers are known for their methodical pace on offense and defense. They may not be as fast-paced as other teams but this philosophy has made Virginia one of the most efficient teams on both sides of the ball this season. Virginia has the most efficient offense of any of the Final Four teams, finishing 9th in Division 1 with 1.008 points per possession. The Cavaliers rarely turn the ball over (#2 in turnovers with 9.1 per game) and are patient as they wait to take the best shot available. The primary offense that Virginia uses is the Blocker-Mover. It is a motion offense that has three movers cutting off of screens from the two blockers. This typically gets the guards open shots off of pindown screens and flares. The Cavaliers are very good at scoring off of cuts and screens but this season they have scored at an elite level passing out of ball screens. Using ball screens takes advantage of their tremendous passing abilities by drawing two defenders on the ball and allowing the ball handler to make a decision to hit the open man for a shot. In this play, Virginia starts out in its Blocker-Mover motion offense. After passes off of two pin down screens and a flare screen, 5 sets a side ball screen for 1. Because of the constant movement in the offense and the randomness of the ball screens, there was no defender in position to help on 5 rolling to the basket. 1 hit him with the pass for an open layup. 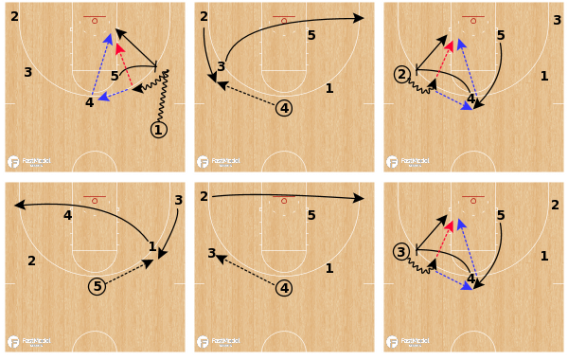 As an alternative to the Blocker-Mover offense, Virginia uses a pick and roll continuity set that provides multiple opportunities for ball screens in a single possession. This set keeps with its philosophy of controlling the tempo and being patient to get an open shot. The continuity offense often starts with a side ball screen with the opposite post at the top of the key and perimeter players on the weak side wing and corner. 1 dribbles off the ball screen looking for 5 rolling to the basket. If he isn’t available, 1 immediately passes to 4 up top. 4 looks for a quick pass to 5 continuing his cut to the rim. This is extremely effective against teams that hard hedge because x5 now has to sprint back to the paint to take away the layup. If 4 doesn’t have anything, he will reverse the ball to one of the perimeter players. Just like in its motion offense, Virginia gives its players freedom to make decisions in this play. Most of the time 3 will make a backdoor cut, then 4 will follow his pass to 2 with a ball screen. This action can run continuously on both sides of the floor until The Cavs get the shot they want. The Cavaliers have the option of 4 reversing the ball to 3 and following with the ball screen. If this happens 2 cuts to the opposite corner, taking the place of 3 and keeping the continuity going. As efficient as Virginia is on the offensive end, it is even better on defense. The Cavaliers have allowed the fewest points of any team in Division 1, at 55.4 points per game. Part of this can be explained by their ability to slow the game down but the Cavaliers are also ranked 6th in Division 1 with 0.886 points per possession allowed. Virginia is well known for its pack line defense. Instead of denying perimeter passes all of their off-ball defenders are in help position below the pack line, which is a step inside the three-point arc. Their goal isn’t to create turnovers but to protect the paint, force a contested shot and get the defensive rebound. So far that has been a successful strategy. Opponents are only shooting 38.4% overall (4th in Division 1), and only 27.8% from three-point range (#2 in Division 1) as they collect 77% of available defensive rebounds. When examining the different parts of Virginia’s defense they are very good in a lot of areas, but an area that stands out as truly elite is in their pick and roll defense. This starts with their guards putting pressure on the ball. Their perimeter players do a great job of keeping the ball in front of them and forcing the ball handler to use the screen. This allows them to send the ball to their teammates and utilize their help. Once the ball is sent to the screen, the Cavalier post players are outstanding at sprinting out and hedging the screen. Their goal is to stop the ball handler’s progress toward the basket and send him back to half court. Once their teammate gets through the screen, the post player sprints back to his man. A third area where Virginia’s pick and roll defense is elite is that the players that are not involved in the ball screen are ready and in help. They do a good job of stunting at passes and helping on the roll man. This buys time for the post player who hedged the ball screen to get back to his man. In the clip below Virginia’s post player Mamadi Diakite had to cover three consecutive ball screens. He was able to get out and hard hedge the first two times. On the third ball screen he was late but kept the ball in front of him so the ball handler couldn’t turn the corner. Notice how each time he recovered to his man his teammates were in help, stunting at the ball to buy him time to get back. By having their post players hard hedge the ball screens, Virginia needs to provide help when the screener rolls to the basket. x5’s first job in this situation is to redirect the ball to half court and not allow 1 to turn the corner and get in the lane. If he is too concerned about his matchup with 5 he won’t be able to provide great help on the ball screen. This is where x3 comes into play to provide help until x5 gets back to his match up. X3 has a tough job to do. He has to tag 5 and take away the pass for him rolling to the basket. He then has to change direction and close out on his man to contest the shot and take away any penetration. This is a very difficult action to guard but by being aggressive and providing early help Virginia is able to cover for each other and take away high percentage shots at the rim and open shots behind the arc. Virginia’s play on both ends of the floor has been outstanding so far in the tournament. If the Cavaliers keep up the efficiency that they have played with all season long, they will be cutting down the nets on Monday night.